Have I mentioned lately how much I adore all of you? Well, if nothing else gives it away, this post should. I have made absolutely NO secret of my distaste for peanut butter 😛 I think I burned out on it as a kid cause I just don’t much like it now. I do however love weird flavored ones, like Jifs smores one or a few flavors from Peanut Butter & Co. And I even get a craving for a PB&J like twice a year. But do I have the love for it that I hear many people talk of? Do I have a spoon permanently stuck in a jar of Skippy? Do I make recipes and then rhapsodize over the intense flavor of peanut butter? Do I make plans for a secret wedding and honeymoon in the Bahamas with a jar of Kroger brand? Ok, so maybe I haven’t really heard of anyone doing that, but give it time… give it time. I have a few peanut butter loving friends who are single. Moving on now… I adapted this from a cake in my Bon Appetit cookbook. 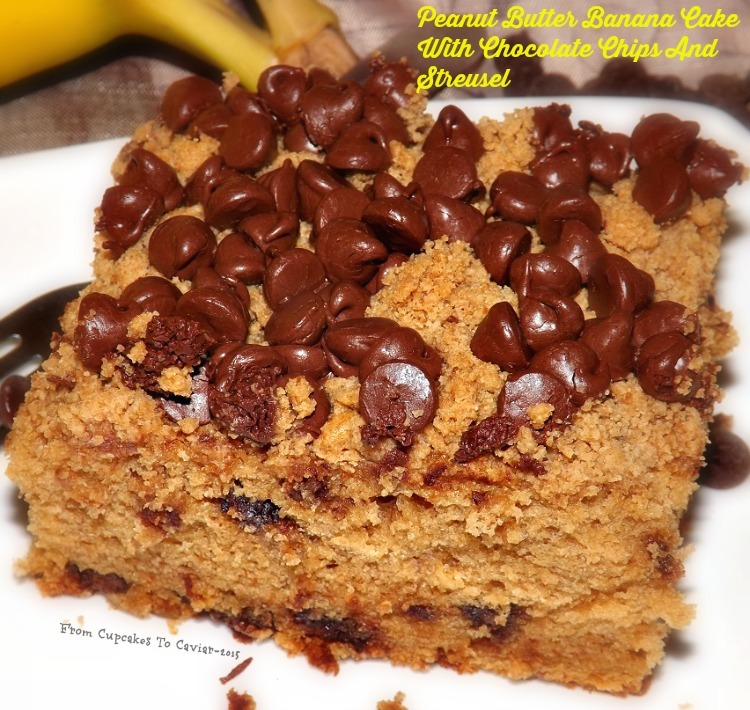 I know the combo of banana, peanut butter and chocolate is popular, so I thought we’d go there. According to my husband, who likes peanut butter (and I also keep him too, in spite of this fatal flaw), this isn’t a heavy peanut butter flavor. I tried a bit (SEE how much I love you?) and I disagree. I tasted peanut butter, banana and then there’s the chocolate chips. I like chocolate chips. 😀 This is a nice tender snack style cake, one of those that would go great at a church pot luck or t share with the neighbors. It has a nice texture thanks to the streusel. Preheat oven to 350 degrees. Grease a 13×9 inch baking pan. In a large bowl, combine the flour, brown sugar, peanut butter and butter. Use a heavy spoon to mix well until it is blended and crumbly. Scoop out one cup of this mixture and set aside. Add the eggs, milk, mashed banana,baking powder, baking soda, vanilla and banana flavorings to the bowl. Beat on low speed with a hand mixer until moistened. Then increase the speed and beat until well blended, about 3 minutes, scraping bowl as needed. Stir in one cup of the chocolate chips. Pour batter into the prepared pan. Sprinkle with the reserved streusel, then with the remaining chocolate chips. Bake at 350 until a skewer inserted in the center comes out clean, about 30 to 35 minutes. Let cool in pan. Cut and serve. Store loosely covered at room temp. I have mentioned more than once that generally speaking, I don’t care for peanut butter. never have, never will. Strangely, while five of my six kids like peanut butter, one of my sons has never liked it either. That is so weird to me! You don’t think of food liking as being in any way genetic, but with six kids, I have learned that they really do seem to be in some cases. That same son hated bananas for many years. His father, whom he hadn’t lived with since an extremely young age, also hated bananas. Go figure. But every once in a while, I get a strange (strange because well… I don’t LIKE pb so it’s akin to a rabid vegetarian suddenly craving steak tartare) craving for something peanut buttery. Usually I just have a peanut butter sandwich and that’s that; I’m done for 6 months or so. But today I was working on a blog post anyway. It was supposed to be chocolate whoopie pies with chocolate filling (I hear some of you sobbing out there because I changed it lol) but the peanut butter and jelly sandwich craving hit (twice a year, like clockwork 😛 ) and my 4 watt mental light bulb went off and I thought to myself “self ( I call myself self when I’m not calling myself somewhat obscene names), why not make a peanut butter filling for these instead?! The you can use that bag of mini reeses cups you bought and never ate!” Then I had another flash of brilliance and decided to add some raspberry jam in them pies. Raspberry goes well in PB&J sandwiches and it definitely goes well with chocolate so… voila, Peanut Butter & Jelly Chocolate Whoopie Pies were born. Well, born in my household anyway. I’m sure that at some point they were born somewhere else already lol. I then congratulated myself for being a genius, made myself a cup of tea and had some chocolate as a reward for being so brilliant and got started. The end result is pretty yummy if I do say so myself. Mind you, my whoopie pies aren’t flat and tiny like most. Why you ask? Because I’m lazy. It was much easier to put the cookie batter in my muffin top pan than to spoon out each individual cookie and make sure it was shaped nicely. The benefits of this is that you also get these cool crispy edges as well as some HUGE arse whoopie pies hehe. 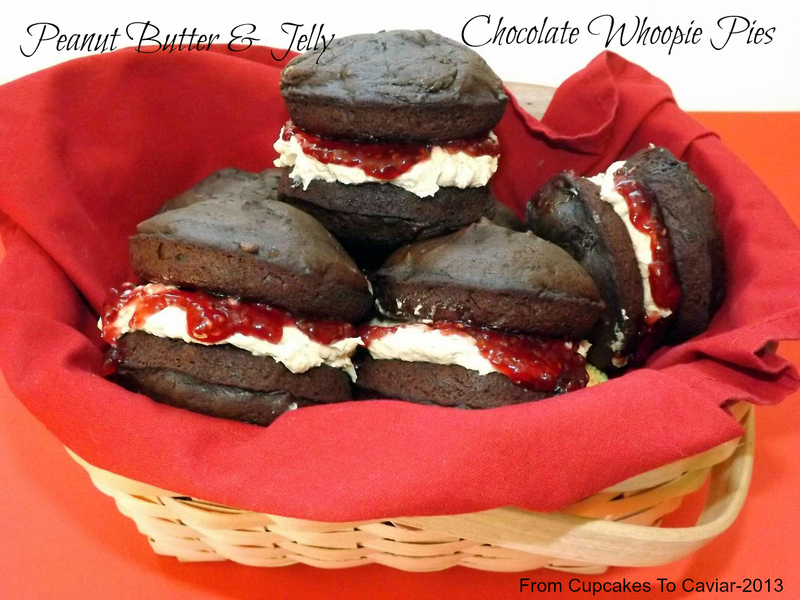 But I will write the directions as written in the cookbook (aptly called “Whoopie Pies” by Sarah Billingsly). Just know that you CAN do these in a muffin top pan too. You’ll just get less but bigger pies and they will be thicker. You know the drill… get to cookin’! Preheat the oven to 375. Line 2 baking sheets with parchment paper. Sift together the flour, cocoa powder, baking soda and salt onto a large piece of waxed paper. In the bowl of a stand mixer (can use a hand mixer if you need to), beat the butter, brown sugar and shortening on low speed until combined. Scrape down the sides of the bowl, increase the speed to medium and beat for about 2 minutes until smooth and creamy. Add the egg and vanilla extract and beat on low speed just until combined. Turn off and scrape down the bowl again. Add half of the flour mixture and half of the milk and beat on low until combined. Add the remainder of the flour and milk and again, beat on low until just combined. Spoon batter, about a tablespoon at a time, onto the prepared baking sheets. Bake for about 10 minutes at 375 degrees or until the cookies spring back when touched gently. Let them cool on the pan for about 5 minutes, then remove to a rack to cool completely. Make your filling- In a medium bowl, combine the peanut butter and butter. Beat at medium speed until smooth & creamy. Add in the powdered sugar and beat on low until combined, then turn the mixer up to medium and continue beating until it is creamy and fluffy looking. 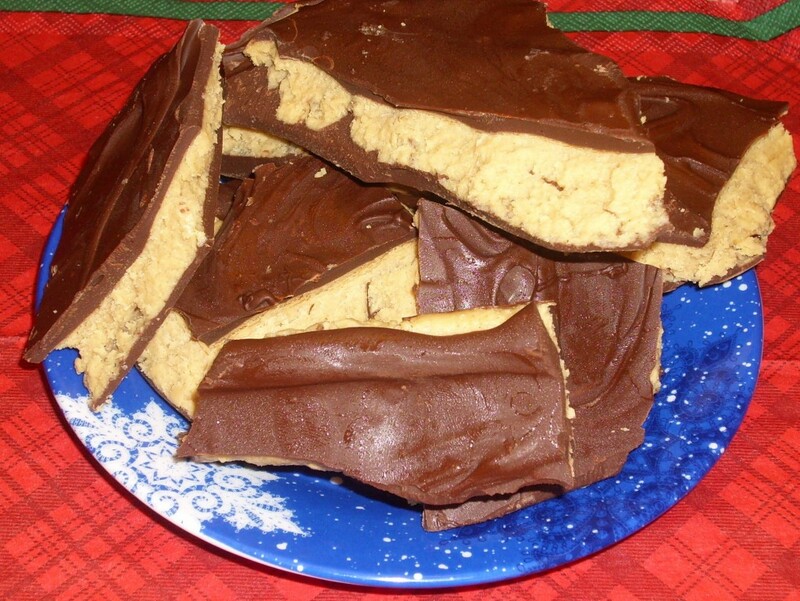 Fold in the chopped reeses cups. I may have ranted mentioned before my irritation with people who are constantly talking about how they would never do this or never do that or “omg, how can you USE this when you cook? !” when it comes to cooking and ingredients. You know the ones I am talking about? The who claim that a preservative has never ever passed their lips, that everything they cook with, feed their family and/or eat is organic, humanely raised, home made down to growing the ingredients themselves, even the wheat. And God forbid they were to ever eat something made with a prepackaged mix. Mind you, these are also the same people who, were a world crisis to happen, would be the first to uphold all of Darwins theories about survival of the fittest because they are too entrenched in one way of cooking and eating. Though, mind you, I am personally convinced that 98% of them frequently hide in their closets and eat Hershey bar or Little Debbie snack cakes, but I’ll admit that I may be projecting a bit there 😛 The other 2 percent just scare me. But the people who supposedly live by this credo would be missing out when it comes to these brownies. Why? because they are made with *GASPS LOUDLY* a boxed mix. The recipe comes from one of those Pillsbury monthly books. I used to buy them all the time and I have had this one for over 20 years. I’m not even sure they make these cookbooks anymore actually which is a shame because they helped me a LOT in my early years of cooking for a family. 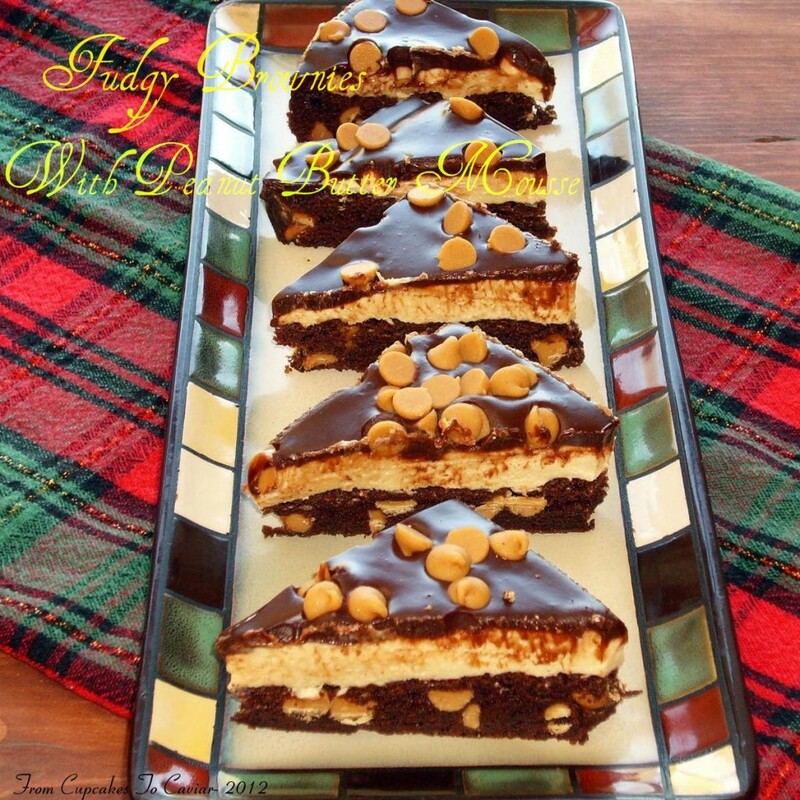 When I first decided to use this recipe, I considered improvising and using a homemade brownie recipe for the base of these. It was a case of wanting to look good and not wanting readers or other bloggers to roll their eyes at me. But then I remembered that when I MADE this blog, one of the things I promised myself and any readers I would get in the future was that I would NOT be someone full of pretense. I would blog the way I cooked. And while I rarely use boxed brownie mix, it has been known to be made in my household. It’s easy, they taste good, it’s a good way to get kids into cooking and it’s quick. Many of you know that I’m not a peanut butter fan for the most part. But every once in a while I still use it because my family enjoys it. And I have to admit… I really really like these. The brownie is nice and chewy and the creamy topping is rich with a slight tang from the cream cheese. Add in the ganache topping and I would happily wager that they could convert many a boxed mix hater (and peanut butter hater like me). There is nothing about these that screams “boxed mix”. They are also pretty darn attractive and would make a good addition to any cookie tray, be it for the holidays or a Summer bbq… whatever. So go on… go buy a box of brownie mix. G’wan. Preheat oven to 350 degrees. Butter a 13×9 baking pan. Line it with parchment paper then butter the bottom only of the paper. Trust me… use the paper. it’s not expensive and it will be nearly impossibly to get the brownies out neatly otherwise. Cool in pan set on wire rack until completely cooled. When cool, make the mousse. In a large bowl, combine the peanut butter, the butter and the cream cheese. Mix until smooth and creamy. Slowly add in the powdered sugar. beat until you have a spreadable creamy mixture. Eat a few spoonfuls hehe. Spread the mousse mixture over the top of the brownies. Refrigerate while you make the ganache. To make the ganache, put the semi sweet chocolate in a small bowl. Scald your cream then pour it over the chips. Let it sit for about 3 minutes or so then stir. the heat should have melted the chips quite nicely. Stir until smooth and shiny. Let the ganache come to room temp. Do NOT pour over the mousse when warm or you’ll melt the mousse. When it’s at room temp, slowly pour the ganache over the peanut butter mousse. Use it all. When it’s poured, refrigerate the pan to let the ganache set up. When chilled, cut into squares… or circles… or hexagons if that makes you happy. You Got Your Chocolate In My Peanut Butter! Anybody else remember those extremely silly commercials from back in the day? You have one person walking somewhere with a jar of PB (like the person who posted the video asked, who walks around munching from a jar of peanut butter?) and another walking around with a chocolate bar. They crash, the foods collide and junk food magic is created, aka Reeses Cups. I’ve mentioned before that I’m not a huge peanut butter fan. I would go hungry before eating peanut butter cookies (I can’t even handle the smell of them cooking lol), I tend to omit the peanuts or PB in any recipes needing it and I eat a PB&J sandwich maybe twice a year. I DO however like Reeses Cups (and cinnamon raisin peanut butter but that’s a different post). They may be peanut butter but the taste is different. So when I saw the following recipe here on Big Red Kitchen , I knew I had to try it. Especially since I knew that in my family, it would be a hit. One of my sons is about like me when it comes to PB but the rest of them like it and my daughter in law would kill someone to swipe this from them Love you Tiffy!) 😛 . The rest of you, if you like peanut butter or Reeses Cups, give this a try. 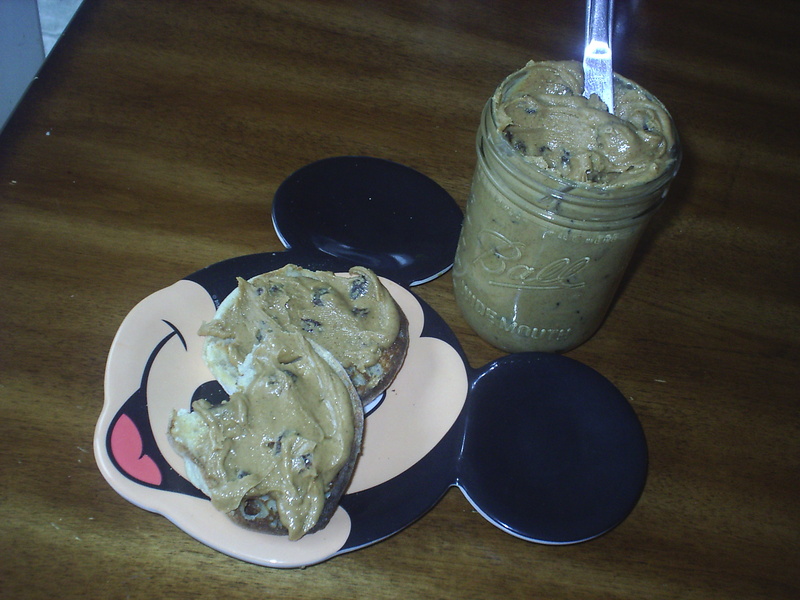 It tastes amazingly similar to a pb cup yet is more fun somehow with the big chunks (ok, that’s just cause I’m a pig) and homey look of it. This is exceedingly simple to make…and way too easy to eat. 😛 The only thing I really changed from the original recipe was to use chocolate chips instead of candy coating because I don’t care for the somewhat fake flavor of coating. 2 1/2 pounds candy coating (or chocolate chips. (I used half milk chocolate, half semi sweet. Melt half the chocolate according to package directions. Spread it out to about 1/4 inch thickness on a lightly greased baking pan. The original called for parchment paper lined but over time (over 30 years of cooking. OMG, I’m freaking OLD! ), I’ve learned what can go w/out the called for parchment and I knew that since the chocolate would harden in the fridge and be able to be lifted off, it wouldn’t be needed. In a large bowl, combine the peanut butter, powdered sugar, butter and vanilla. Beat well. The mixture will be thick. Crumble this over the top of the first chocolate layer. Refrigerate this for at least a few hours or overnight until totally hardened. I am currently reading the King Arthur Whole Grain Cookbook (yes reading; not scanning; doesn’t everyone do that? 😛 ) and they have a recipe in there for peanut butter chocolate chip waffles. I saw that and knew it would perfect for both my family and the peanut butter loving blog community. This also takes it into the Elvis realm with a banana topping. Now THAT I liked. With a spoon. In my mouth. by itself. YUM! The recipe didn’t call for the following but to up the “OMG” level for everyone I made a chocolate/peanut butter sauce to put on top also. If you like waffles, or like peanut butter or like chocolate or like bananas, you will like this 😀 As they cooked the whole kitchen smelled like a peanut butter factory lol. The original recipe calls for spelt flour so feel free to sub that if you want. This is a long list of ingredients but very quickly put together. Banana Cream- Mash the bananas in a small bowl with the sugar, cinnamon and lemon juice. In separate bowl, beat cream until stiff peaks form. Fold the banana mixture into into the heavy cream and refrigerate until the waffles are done. Waffles- Combine the flour, salt and baking powder in a small bowl. Set aside. Cream the peanut butter and sugar together until the peanut softens up. Pour in the melted butter. Add the eggs, one at a time and beat until well blended and mixture is smooth. Add the milk gradually. The mixture will be very soupy. Add the flour all at once and stir just until combined. Fold in the chocolate chips. 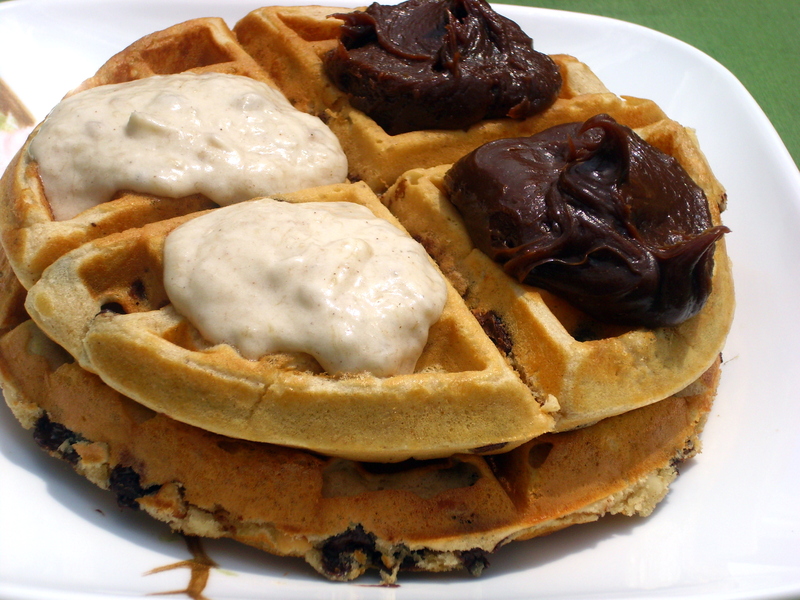 Set aside to rest for at least ten minutes while you preheat your waffle iron and make the fudge sauce. Mix the peanut butter and hot fudge sauce in a small bowl. Microwave for 30 seconds. Stir well. Microwave again until mixture is smooth. Pour about 1/3 to 1/2 cup waffle batter (depends on the size of your iron; mine took close to half a cup) in the waffle iron and cook waffles until are golden brown. Top with some of the banana cream and peanut butter fudge sauce. This will make about 5 waffles. I have said for years that I dislike peanut butter; even posted it in here when I made cookies with Reese Pieces in them. I am coming to realize though that it may not be peanut butter I dislike so much as plain old fashioned peanut butter cookies. Now those… I hate. I remember my sister making them when we were kids and I didn’t care for them then and I was a child who would eat anything sweet, including peanut butter and sugar sandwiches *shudders*. 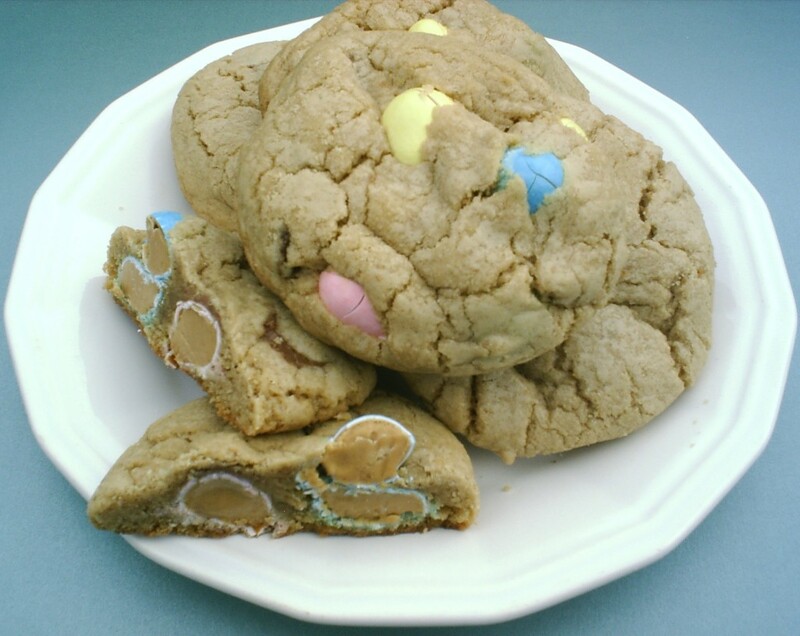 While I am sure my sister is a wonderful cook, I still wouldn’t eat peanut butter cookies now; even if made by her. There are some things too horrid to be contemplated. But though it is something I eat rarely, I may actually…kind of…sort of.. a little bit… like peanut butter. Sometimes. I especially like a certain brand of peanut butter that has some awesome flavors, including cinnamon raisin. Spreading this on toast is like having a peanut butter sandwich on raisin bread. So so good. Also on English muffins and pita bread, on warm rolls so that the peanut butter melts slightly and drips down the side and best of all, just spooned out and eaten straight. Ok, so when it comes to that PB, I’m a junkie. But it’s so darn expensive! Almost 5 bucks for a small container. So I decided to make my own. This is so easy I want to kick myself for not thinking of it before. But if I do that, I may fall and then I wouldn’t be able to reach the peanut butter. So I think I’ll just keep eating instead. Try it… you’ll like it! Put your raisins in a small bowl. Sprinkle them with the tablespoon of hot water. Put into the microwave on high for 20 seconds. Stir them around then cover the bowl with a small plate while you mix the peanut butter. Scoop your peanut butter into a bowl. Beat in the cinnamon and sugar. You can use a little more cinnamon but remember that the flavor will strengthen as it sits so be careful. Mix the raisins into the peanut butter mixture.. The brief sit in the covered bowl helps soften them up a bit. 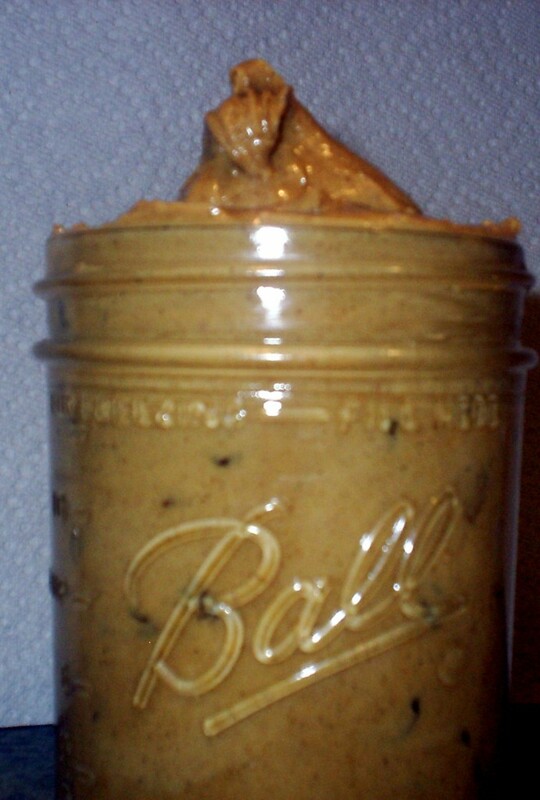 Spoon the peanut butter into a covered container (I used a pint canning jar.) This can be stored at room temp same as any other PB. Hey; it tastes better off of the Mickey plate! Ask any kid! But I Don’t Even LIKE Peanut Butter!! I’ve never been a big fan of peanut butter. Give me a PB&J about once a year & a Reeses peanut butter cup every once in a while and I’m happy. Even with the PB&J, there are strict guidelines that must be followed or I won’t eat it. It has to be Jif Peanut Butter (or Peanut Butter Company’s Cinnamon Raisin flavor), it has to be on smushy “I am so filled with preservatives it’s disgusting” store bought white bread and the ratio of peanut butter to jelly is simply this; there must be enough of each that they drip off of the bread onto my hands, onto my shirt, onto every surface within a five foot range. So why, when perusing the Easter candy aisle at Kroger the other day, did I drop a bag of Reeses Pieces into my cart? I have no idea. I have never liked them. But I think I have found a way that I can enjoy them… in massive quantities… with milk… and hidden away by myself so that nobody else can have any. Ever. 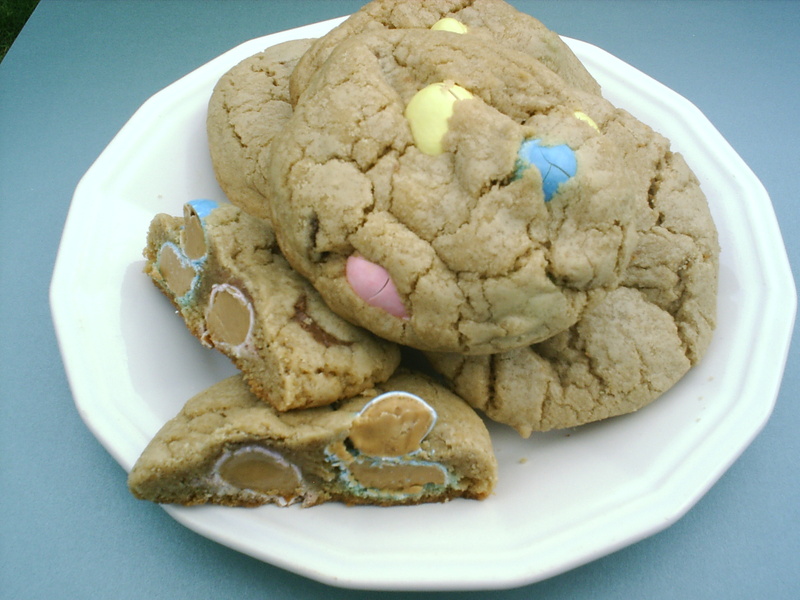 I took my go to chocolate chip recipe (it’s one that I have played with over the years until I got that nice chewy yet crispy texture that I think a cookie should have) and added a bag of Easter (oooo, look at the pretty colors!) Reeses Pieces along with two small bags of the new Reese Peanut Butter Cup Minis (2.5 ounce bags you can find at the checkout aisle). If you like peanut butter, you’ll love these. If you like chocolate, you’ll like these. If you’re a fan of Reeses Pieces, you should be in heaven. Just remember…. massive quantities and all by yourself so nobody else can have any. In large bowl, cream butter, sugars, vanilla and eggs until creamy. In small bowl, mix together salt, baking soda and flour. Mix flour mixture with wet ingredients until fully combined. Add in the Reeses pieces and mini peanut butter cups. Put by large spoonsful on an ungreased cookie sheet (mine were probably a bit less than 1/4 cup dough per cookie. They need to be large to be able to enclose the candy; otherwise it sticks out and will end up melting all the pan and sticking). Bake until light golden brown. 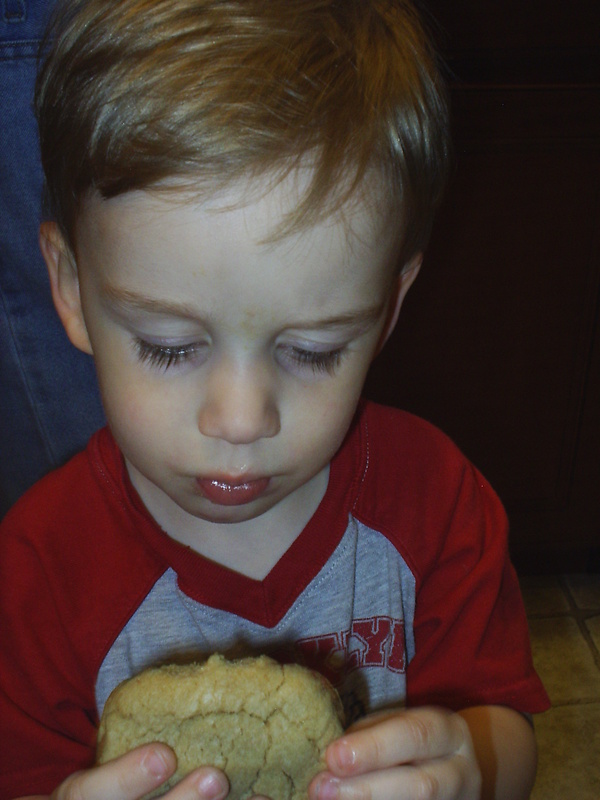 If there is a shiny wet spot in the middle of the cookie, leave for another minute or two and check again. They are big so you need to watch to make sure they cook thoroughly. Mine took 15 minutes. Get some cookies, a glass of milk or cup of coffee and go hide in the closet until you’re done. "Hmmmm, I wonder if I can grab the rest and hide in the closet before momma notices?"